Archives : MARKET GIVES UP WEEKLY GAINS - 03/06/2011. MARKET GIVES UP WEEKLY GAINS – 03/06/2011. The market went up as there was a bullish Takuri Line formation in both the indices, last week. But the indices were not able to sustain at higher levels and gave up a major part of the gains on Friday. The volatility witnessed at higher levels was because the different timeframe trends were not in unison. Only short term trend had turned up and the medium term and long term trend were still down. As a result the medium and long term trends tried and impose themselves on the short term trend and that explains the volatility witnessed by the end of last week. The Sensex opened the week at 18319 made a high of 18672, a low of 18199 and closed the week at 18376. The Sensex gained 110 points on a weekly basis. Similarly Nifty opened the week at 5493, made a high of 5604, a low of 5458 and closed the week at 5516. The Nifty closed with a gain of 40 points on a weekly basis. Market required a bullish white candle to be formed last week and was on course for doing that. But the fall on Friday made sure that the market made a neutral white body Spinning Top formation on the weekly charts. The bearish aspect is the long upper shadow, which signifies selling at higher levels. On the daily charts, both Sensex and Nifty completed a Bearish Engulfing pattern on Friday. Thus the very short term time frame has turned negative. Only a close above the weekly high will negate the effect of Bearish Engulfing. Sensex made a Rising Gap while moving upwards, between 18072-18087. This gap is expected to provide support in case of a fall. One can still consider the market to be in a pull-back mode as long as the low of 17786 for the Sensex and 5328 for the Nifty is not violated. We have to consider a pull-back of the fall from 19811-17786 for the Sensex and 5944-5328 for the Nifty. The pull-back levels are placed at 18560-18799-19038 for the Sensex and 5563-5636-5709 for the Nifty. If we consider the entire fall from 21108 to 17295 for the Sensex and 6318 to 5177 for the Nifty then the pull-back levels are 18751-19202-19651 for the Sensex and 5621-5758-5895 for the Nifty. The market is well below the long term average i.e. 200dma (Sensex – 19181 and Nifty – 5757) and medium term average of 50dma (Sensex – 18817 and Nifty – 5645). But the market has closed and managed to stay above the short term average of 20dma (Sensex – 18295 and Nifty – 5483). As a result, the short term trend has turned positive while the medium term and the long term trends continue to remain down. As the medium term and the long term averages are above the current market price, they will act as resistances. There exists a strong support line in the form of demand trendline at Sensex 17855 and Nifty 5342. This is a very critical support line and the market has been respecting it for the past 18months. 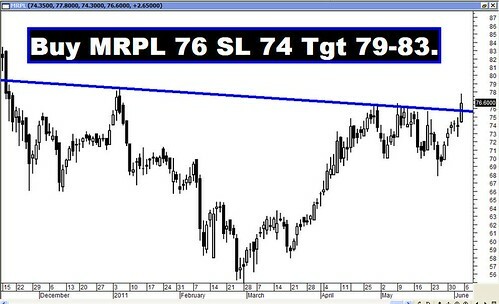 The market tested this trendline two weeks back and managed a bounce-back from this trendline. A breach of this support line will confirm a Bearish Head and Shoulders Reversal pattern. This will be herald a strong bear onslaught. On the higher side the 50% pull-back level of the immediate fall, 38.2% of the entire fall, and 50dma all converge and are placed nearby, thus forming first resistance zone i.e. from Sensex 18751-18817 and Nifty 5621-5645. Above this, there is a second resistance zone formed by the convergence of 50% of the entire fall, trendline resistance and 200dma. Thus Sensex 19181-19279 and Nifty 5757-5794 forms a second resistance zone. The market completed a small Bearish Head & Shoulders and the target for which is Sensex 16573 and Nifty 4964. The target for this Bearish Head and Shoulders will remain intact as long as the market remains below Sensex 18724 and Nifty 5605. MACD even though in negative territory, has given a Buy signal. ROC is positive and hence in Buy mode. RSI has just fallen below 50 and is at 48, giving a Sell signal. A close above the 20dma (Sensex – 18295 and Nifty – 5483) has negated the Sell signal generated by the Bollinger Band. Money Flow (53) continues above 50 suggesting that money has flowed in the market at lower levels. OBV has started moving higher but is yet to signal a Buy. Stochastic oscillator has given a Sell signal as %K has cut %D from above. The Directional Indicators have given a Buy signal as +DI has cut –DI from below. Nifty O.I. PCR is reasonably placed at 1.35. Highest Open Interest build-up is seen at 5400 Put followed by 5000 Put. Highest Call writing is seen at the strike of 5800. This suggests that the market is likely to move in a range of 5400 to 5800. 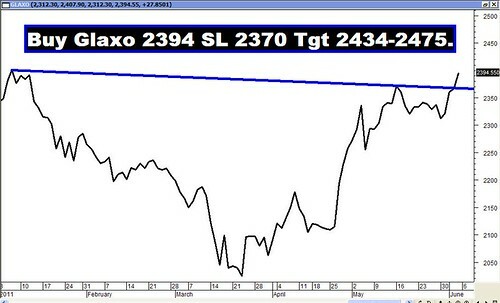 The Trendline Resistance for the Sensex is at 19279. The Trendline Support is at 17855. The Trendline Resistance for the Nifty is at 5794. The Trendline Support is at 5342. For the week ahead, Sensex will find Support at 18160-17926-17712 and will find Resistance at 18690-19003-19340. For the week ahead, Nifty will find Support at 5443-5373-5310 and will find Resistance at 5605-5698-5801.